Last weekend saw me traveling south, leaving the smog and pollution of Seoul. 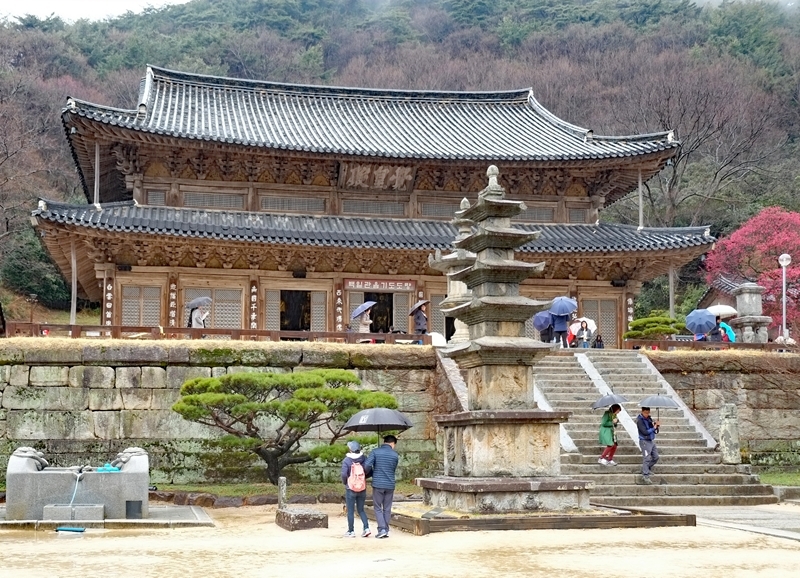 One of our first stops was Hwaeomsa Temple. Welcome to week 322 (03/30/2017) of Travel Photo Thursday. 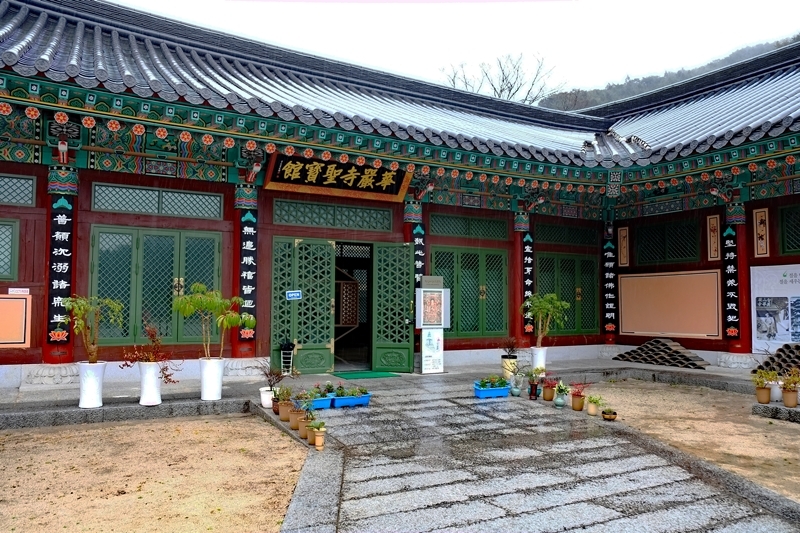 Located on the slopes of Jirisan Mountain, Hwaeomsa is one of the ten most famous temples in Korea. Join me as I take you on a photo tour. 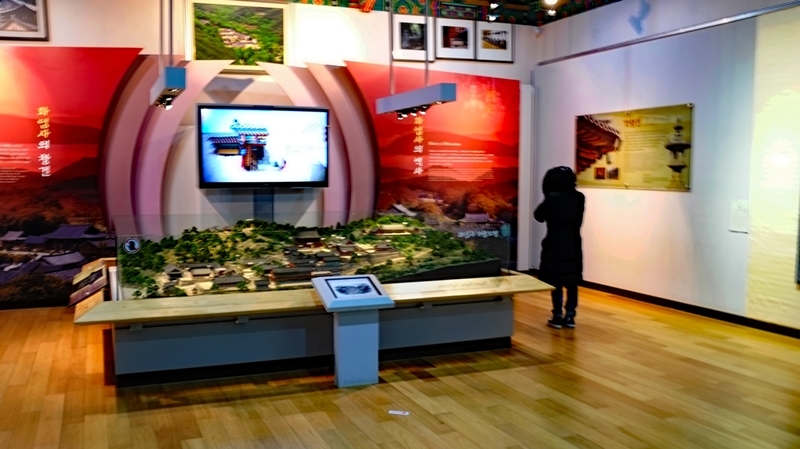 I was excited to be visiting Hwaeomsa for the second time. My first visit was many years ago, before I began this blog, chanting, meditating, and bowing with the monks for two days. 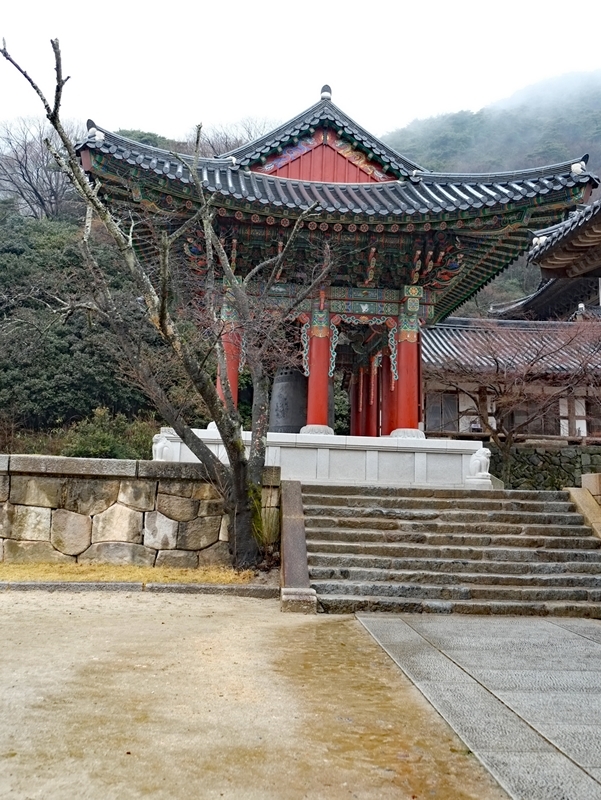 Those were magical moments, but I was secretly glad that I wouldn’t be woken up at four in the morning this weekend  Built during the Silla Dynasty (668-935), the temple was burnt to the ground during the 1502 Japanese invasion, and rebuilt during the Joseon Dynasty (1392-1897). 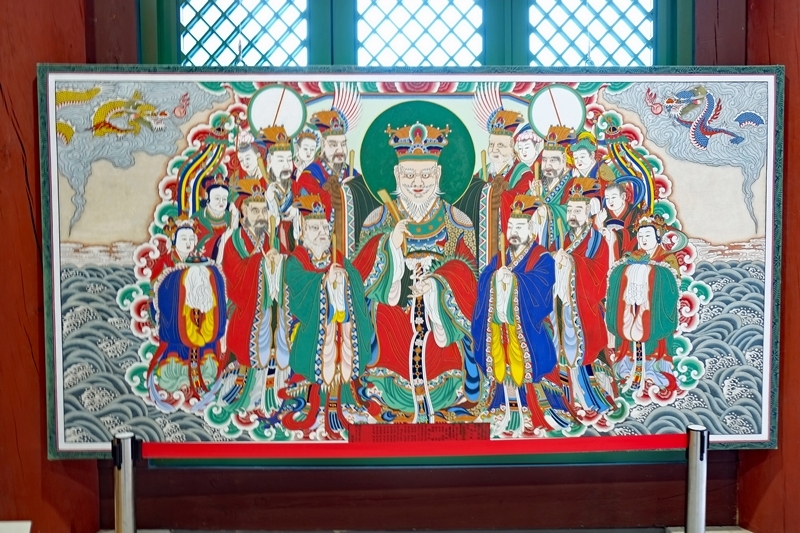 Hwaeomsa Temple is also the head temple of the Jogye Order of Korean Buddhism. 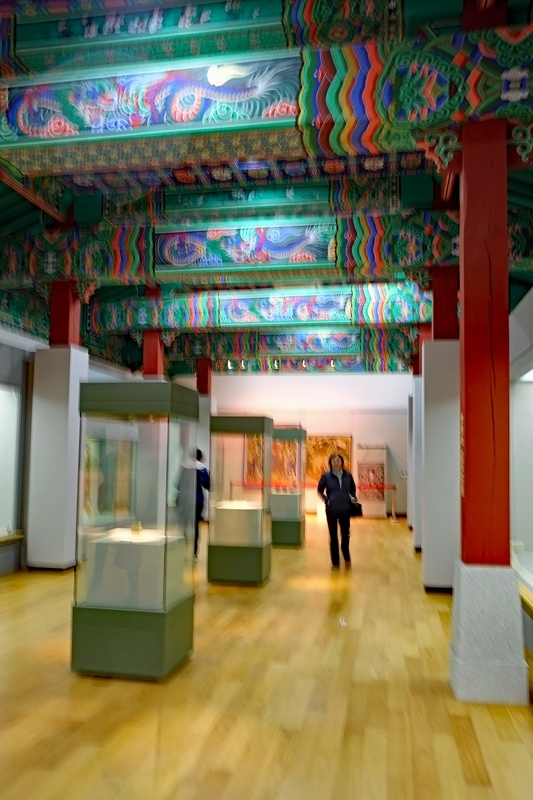 Since my last visit, a museum chronicling the history of Hwaeomsa has opened, housing a replica of the main temple’s ceiling and numerous ancient paintings and artifacts. 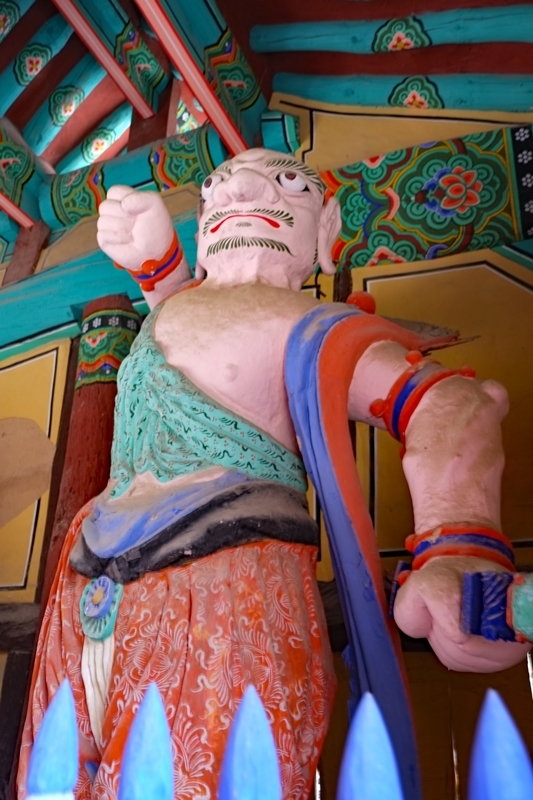 To enter a Korean temple, you must get by numerous ferocious-looking guards. There are four of them striking different poses. This is the first one I have seen that appears to be ready to punch someone out. Those eyes mean business! The walk to the main temple was bone aching cold and wet. I love the fact that “she” has been allowed to age gracefully. The pagoda in front was built in the fifth century, surviving the 1592 fire. Don’t you love the burst of color to the right? 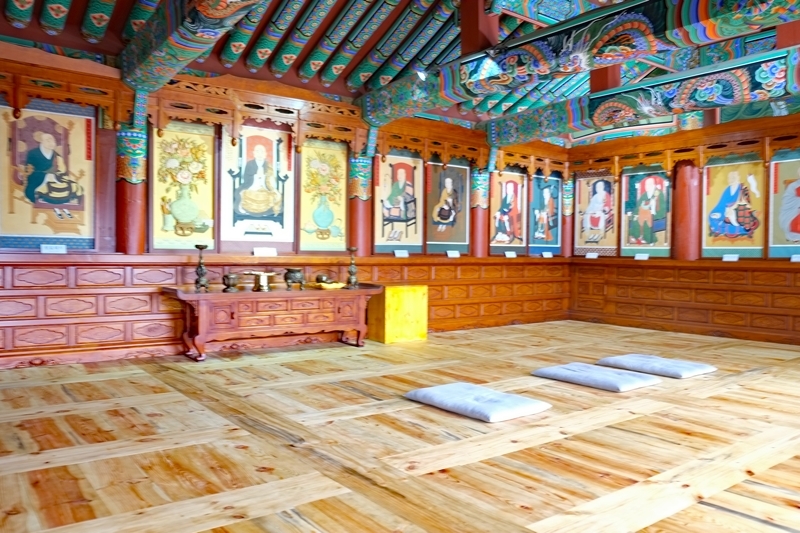 The temple bell is housed in this traditionally painted building. The bell was silent during our visit, but I did stop for a minute to remember the beautiful haunting sounds from my previous visit. By the time we walked back through the temple gate and those scary lookin guards my hands were numb, and my feet felt like lumps of wet wood. Imagine my relief when we were invited to have tea with one of the female monks. To sit on the heated floor was bliss. The nun was chatty and happy to introduce us to a Buddhist tea ceremony. She requested that we not take photos, but it was a lovely way to end out visit. 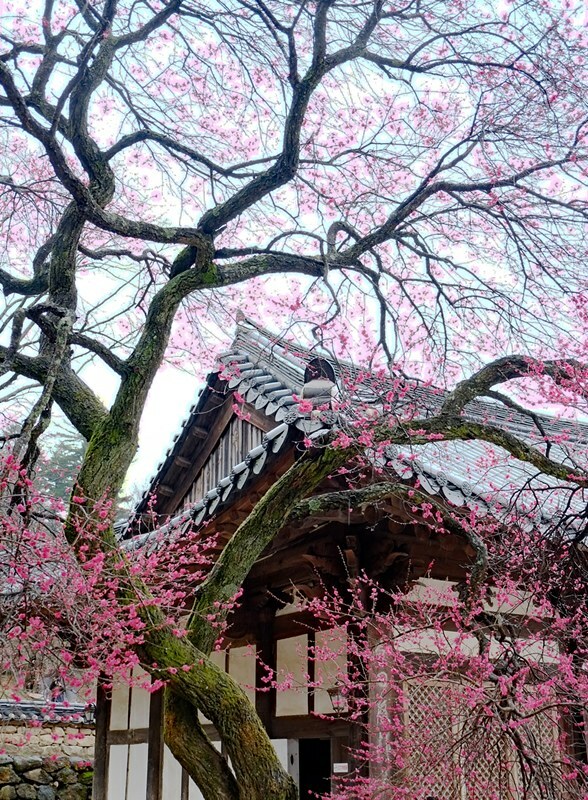 My final photo was of this beautiful pink flowering tree (which is probably in full bloom this week), easily the most photographed in the entire temple compound. 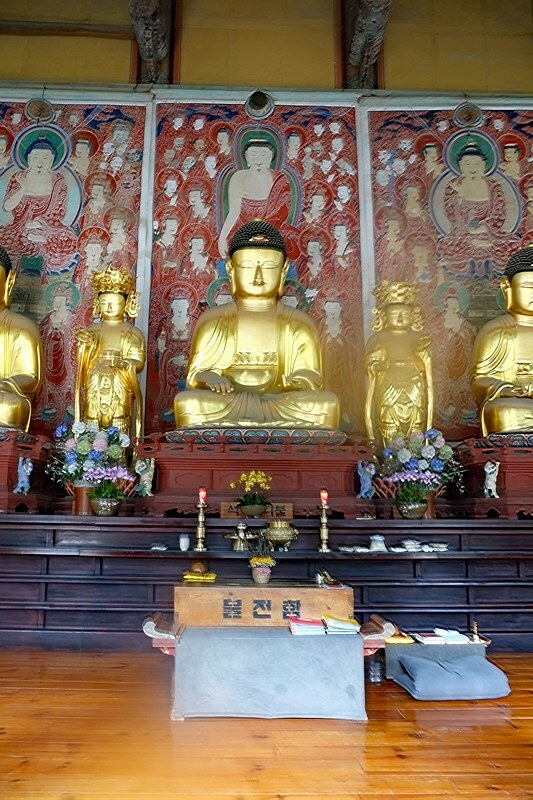 My visit to Hwaeomsa Temple was part of a tour with Goh Travel. 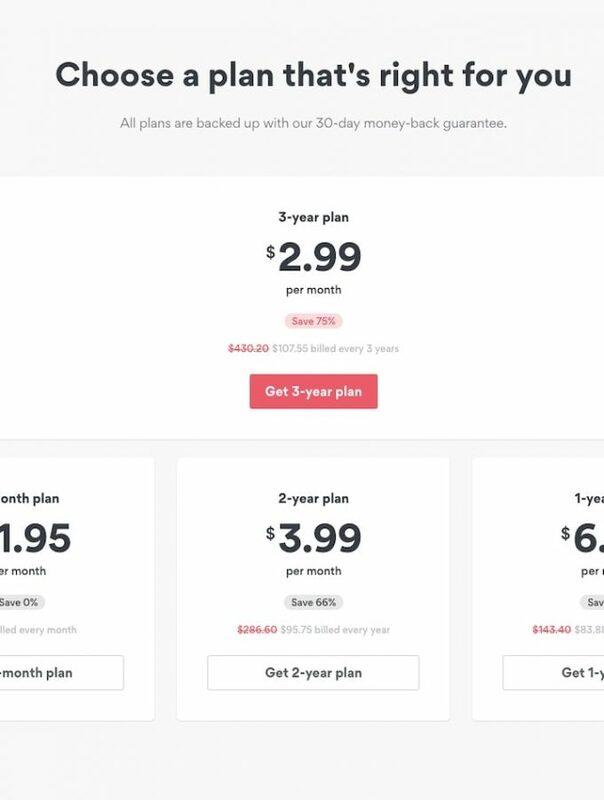 If you’re looking for a good basic budget trip, I highly recommend this company. Hwan, the owner, speaks excellent English and is a very good guide. Have you ever visited a Buddhist temple? Let us know in the comments. Temples are fascinating. 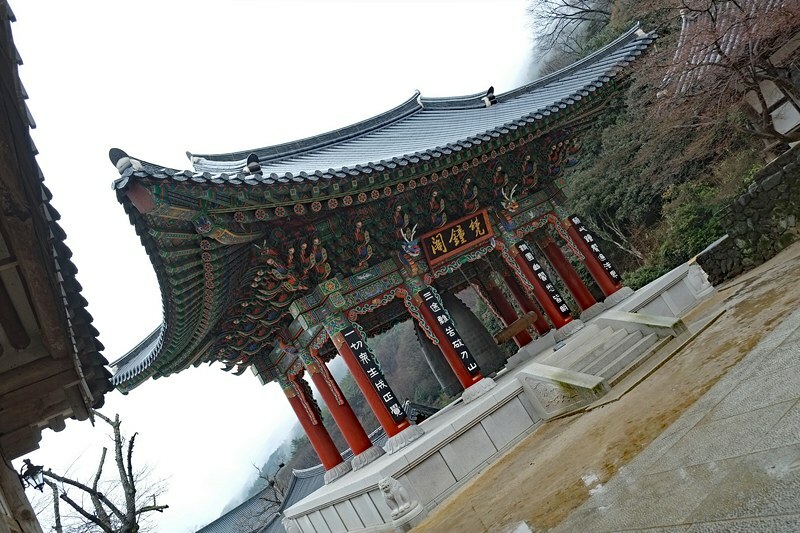 We’ve visited Buddhist temples in Japan but I’d love to visit ones in Korea too. This is a beautiful complex and love that last photo with all the pink. Hi, Mary. Japan has some amazing temples. I would love to have photographed the pink blossom tree once it was in full bloom. Hi, Mary. I love the Japanese temples, too. 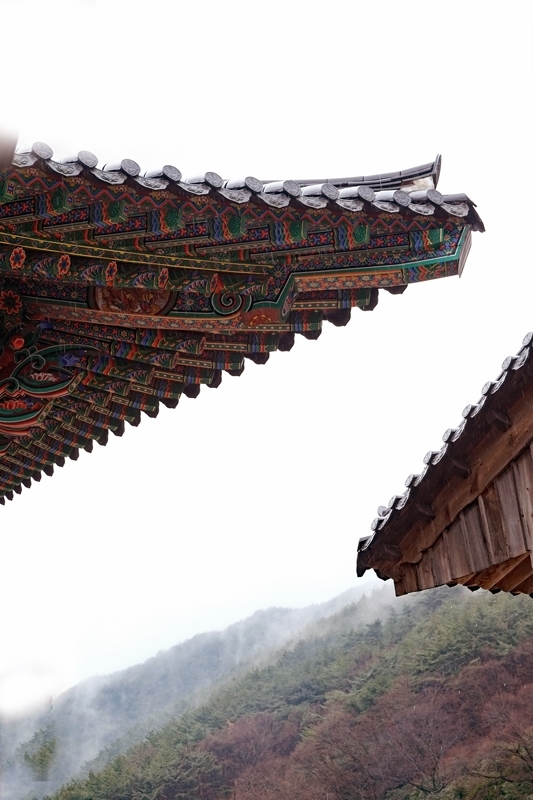 Korea’s temples are very different. Ha ha, Jill. Yeah, the 4am wake-up call is not much fun. I love temples! This looks gorgeous and I love seeing spring signs! My post is about as far as you can get from the serenity of yours! I am in LA! Hi, Jackie. It is a gorgeous temple complex and the fact that spring is on the way is an added bonus. Hi, Ruth. Yes, the temples here are very different from any others I have been to in Asia. The last photo of pink flowers is gorgeous! I would love to see such a mix of colors and intricate design. I’ve visited Buddhist temples and could spend all day exploring their style. Hi, Brooke. I love the pink tree, too. I’m with you when it comes to exploring Buddhist temples. I think that’s one of the things I’ll miss the most when I leave Asia this summer. I’d be scurrying past that Guard, before he landed one on me. I’ve been to lots of Buddhist Temples and love them. This one looks lovely and set in such a nice environment. Spring would be such a great time to visit. Hi, Jan. It is a lovely spot! The temple looks a beautiful serene place. I’m with you about not being woken at 4 am though. It would be tricky to appreciate how lovely it is at that time in the morning. Hi, Lyn. Once was enough  I’m an early riser, but that doesn’t mean I function well! Oh my goodness, I completely missed linking up this week – we continue to be in hot pursuit of our residence visa which when paired with chores has me completely turned around with days and blogging. Loved the tour of the temple and will hopefully be back among the living in the blogosphere soon! Hi, Jackie. I hope the quest for your residence visa is going well. Looking forward to having you back soon. 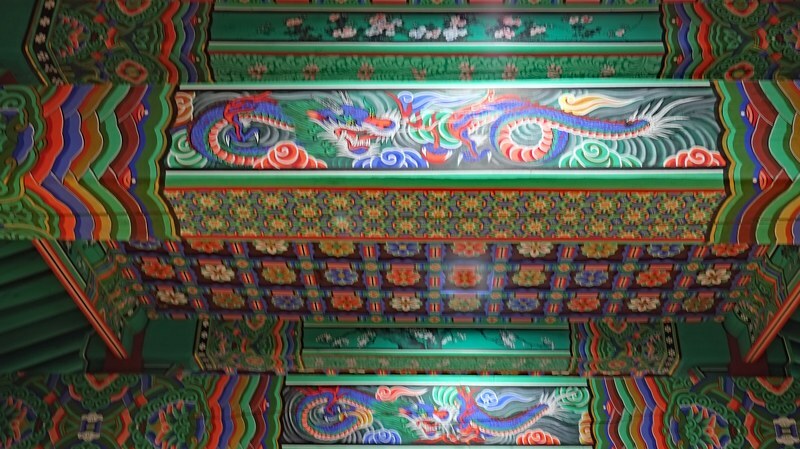 I love the color in Korean temples and palaces! But tea with one of the nuns? That’s truly special! Your last photo of the blossoms is stunning, Nancie and, while it may have been bone-chillingly cold during your visit, the mists hovering by the mountains and the setting look beautiful. So many vivid colors!